Wouldn’t it be cool to get to spend the Year of the Dragon Chinese New Year in BEIJING, of all places? 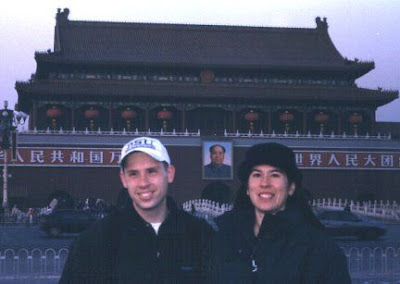 Well, Dave and I had that privledge, but the Chinese tour guide didn’t think there’d be anything for us to see in that department, so we didn’t see anything related to Chinese New Year. The tour was a cultural experience in and of itself. They were very strict about what we were and weren’t allowed to see. All of our shopping experiences were regimented and we went to these state-run souvenier stores. Souveniers were definitely more expensive than necessary. 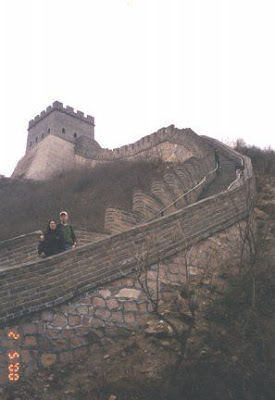 Lucky for us, one of the AF gals with us launched a cultural revolution of her own and threatened the tour guide and bus driver that she wouldn’t get back on the bus at the Great Wall until we went to a “real” tourist shopping area. It worked, we went to this area of tents nearby and got SO MUCH for probably 10% of what we would have had to pay at the state-run stores! I came back with some awesome souveniers — it’s funny, a lot of the younger people on the trip were buying things like stuffed panda bears with light-up red eyes, Little Red Books, and Chairman Mao hats. I was looking for art and jewelry. And that’s what I found. We got a plum blossom watercolor art print from a street vendor for about $5 that we framed up back in Seoul…it was gorgeous. Unfortunately, the movers between FL and NC lost it! At the Great Wall. The climb was quite challenging…we were warned to dress appropriately, although some of the girls still wore high heeled shoes on that day.